The IITA Staff Talent Development Competitive Grant is an annual offering organized by CDO to help achieve the Institute’s commitment to the professional development of staff. The 2019 edition has been announced and applications are now open until 1 March. A Joint Selection Committee of CDO, HRS, and other staff representatives along with the regional hubs will review applications and approve awards according to set criteria. NRS in all IITA locations with two or more years employment in the Institute are eligible to apply. However, short-term staff, consultants, casual staff, research fellows, NYSC members, and IT students are ineligible. Previous recipients from the past two years are also ineligible. 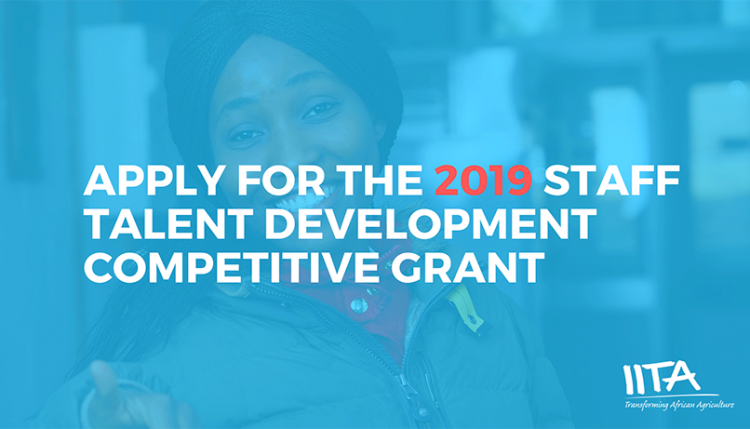 For eligible staff, the maximum grant limit per person or group will be US$4000, which would cover course fees, travel, and accommodation related to training where applicable. Therefore, applications exceeding $4,000 must be indicated in the application. The grant must be used in 2019 as it is not transferrable. However, CDO reserves the right to negotiate the final grant with successful applicants. All applications should be made using this link: http://cdo.iita.org/training. For further clarification, please contact: Stanley Nwachukwu (s.nwachukwu@cgiar.org).